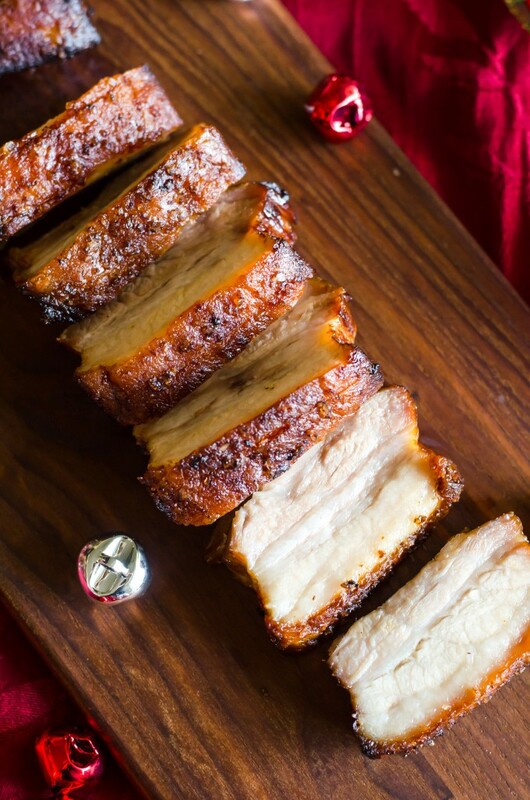 This Crispy Pork Belly recipe is marinated in Asian flavors, then roasted with a salt crust for crispy skin and tender meat. No scoring required! These are all the reasons that I’m sure you’re going to love it as well. If you’ve never had it before, pork belly is the same cut of pig that bacon is made from. Cooked low and slow, the fat slowly melts into the meat, leaving behind tender meat that practically melts in your mouth. It’s incredibly easy- all you do is marinate it for awhile, sky the skin, top it with salt and then slow roast it for a couple hours. Not only does this make it a great dinner option, it makes a FANTASTIC party appetizer- you have the ability to prepare a lot of it at once without a lot of hands-on muss and fuss, leaving yourself open to do other things. As far as meat goes, it’s also on the cheaper side- about $3/lb or less. When shopping for your meat, make sure that you ask for a piece that has a decent amount of meat on it- some pieces can be mostly fat, not leaving you with much to eat when you’re done. Now let’s talk about the salt crust. I’ve prepared this a few different ways over the past couple of years- you can score the skin (a necessity, or the skin will pucker while cooking and be very difficult to cut) or do a salt crust. Although perhaps a salt crust sounds as though it might be complicated or leave your food crazy salty, I’m here to assure you that neither is true. Doing a salt crust simply involves spreading a large amount of salt over the surface of your meat, then removing it after a couple of hours. It will lift off in one nice, solid piece, leaving behind a nicely seasoned skin. If you have any salt stragglers, just brush it off. Both methods work; in fact, I cut my pork in half and prepared each half differently. Both pieces turned out deliciously, but I think I may have preferred the salt crust preparation just a little more. If you’re uncomfortable attempting the salt crust, you’ll have perfectly fine results with by scoring the skin. If you’re scoring the skin, rub it with a little sesame oil and season with salt before baking. Either way, AND THIS IS IMPORTANT, make sure the skin is dry before it goes into the oven. This is absolutely essential, or the skin will basically turn into leather. When you are marinating the meat, do so in the fridge so that the skin is exposed to air and the marinade does not reach the skin. Overnight is best here, but you can get away with 4 hours. Like what you see? 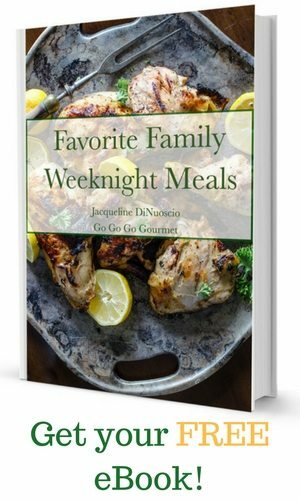 Subscribe to Go Go Go Gourmet’s weekly newsletter to keep up on what’s going on around here and get a free ebook on how to simplify your weeknight dinner making. 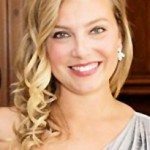 You can also follow me on Facebook, Pinterest and Instagram to see what I’m up to! Baking dish- These Glass Baking Dishes are great for using to marinade your pork overnight. Half sheet pan- This Baker’s Half Sheet is great for any kind of cooking. You’ll get some great use out of it! Wire rack- I recommend using a Baking Rack for cooking your pork and easier clean up! Basting brush- This Silicone Basting Brush will come in handy for spreading sauces in your recipes! 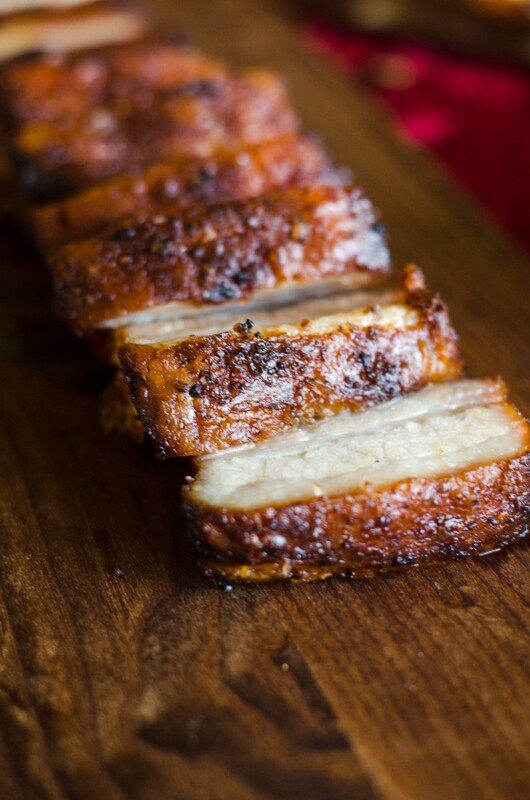 This Crispy Pork Belly is marinated in Asian flavors, then roasted with a salt crust for crispy skin and tender meat. No scoring required! Combine the soy sauce, rice wine, oyster sauce, sugar, garlic, and oil; stir to combine.Dry the skin of the pork belly. Add the pork belly to a baking dish or pan that can accommodate the pork and marinade. Pour marinade into the pan, making sure the level stays below the skin. Refrigerate for at least 4 hours or overnight. Heat oven to 300F. Line a half sheet pan with foil and set a wire rack inside the pan. Remove the pork from the marinade and dry the skin well if any moisture appears. Spread the cup of salt over the skin. Cook in the oven for 2 hours. Remove the salt crust and any salt that remains behind with a basting brush. Increase the oven temperature to 450F. Return to the oven for 15-20 minutes, or until the skin is golden and crispy. Slice and serve. Looks delicious and I’d love to try it. Would you please clarify the exact amounts of soy sauce and rice wine? Thanks! It should say 1/4 cup each. Thanks for calling it to my attention! What do you mean by Sauce Rice Wine? Is that Rice Wine Vinegar or a Rice Wine? It’s rice wine. I think the sauce is there because I had just typed “soy sauce” above! Haha. What is the oven temperature and for how long? Hi Christoper! Sorry for the delay- there was an error in coding that was causing the recipe to not show up. It’s all fixed now! This is the BEST pork belly recipe I have ever cooked. 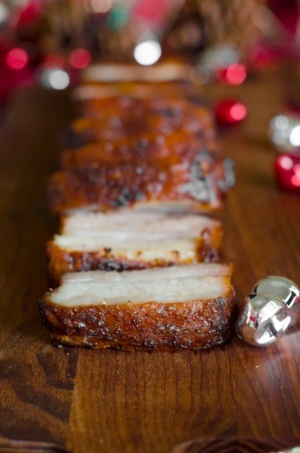 So easy, the crackling was amazing and the flavour fantastic. My 12 year old daughter loved it and I will definintely cook it again. Thank you. Trying this now on a much larger piece of belly. I tripled the recipe. I’ll let you know how it goes.